Participants are encouraged to climb in full gear w/ SCBA, but are not required. Remember this is NOT a race, we are here to climb for who those made the ultimate sacrifice on 9/11. This is an extremely physically demanding event, so prepare accordingly. Participants are asked to arrive a 0700 the day of the event to allow enough to sign-in and to get into appropriate staging area. All climbers will be required to be signed in no later the 0800. Once in your group in staging we ask for you to remain in the area. The Climb: At 8:47am climbers will ascend 110 floors in honor of one of the FDNY 343. Once completed you will place an accountability tag, of the FDNY member you climbed for, on a board to signify they have completed their task. Once again full gear is not required but encouraged. No addition tools will be allowed during the climb with the exception of a Denver High Pack. See video below for instructions on how to fold the Denver High Rise Pack. Hotels: We have two hotels that have a block of rooms for those that would like to stay downtown. The dates are for Friday, September 6th, 2019 and Saturday, September 7th, 2019. 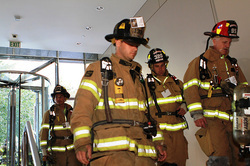 You must state that you are with the OKC 9/11 Memorial Stair Climb during reservation for group rate. You will have to reserve your own rooms. If rooms are not reserved by August 30th, 2019 they will be released to general public.